Jeti transmitters are versatile as we know, there is often several ways to do things and this is a proof of that. There is at least three ways to accomplish this function so why not make a fourth one. 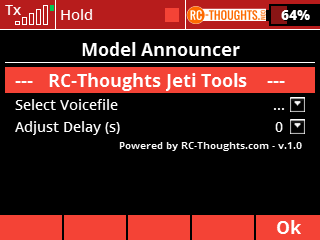 Model Announcer is a app that plays a audiofile meant to play modelname when user selcts the model in transmitter. This happens not only when powering up transmitter but also when changing model. If you are wondering where you can get a audiofile saying for example “Carf Sukhoi SU-30” take a look on RC-Thoughts free Text-To-Speech service! Model Announcer is compatible with DC/DS-14/16/24 with firmware 4.22 and up. No other requirements. After that go to transmitters menu Applications -> User Applications and add the RCT-Mann to your running applications. 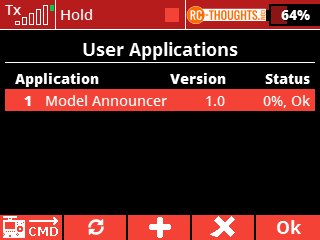 Application can be accessed from menu Applications -> Model Announcer. You have two settings, select the file to be played and after testing if you need or want a delay then adjust it accordingly. No other setting required. Same app is used across all models. So install the app to all your models and set settings and audiofiles as you like. You don’t use it, after setting up everything is automatic. Change model to another and then come back to the model you set Model Announcer for and test.